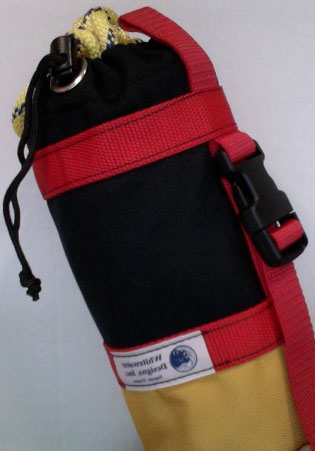 Tall Kayak Rescue Bag with 70ft. of 1/4" Poly Rope - 10" tall, 4" diameter, gold and black. Meets rigorous demands of outfitters, paddling schools, river aficionados. Draw cord through spur grommet, strap with quick-release buckle, easy to attatch to boat without carabiner. Lower section: double layer 1000d Cordura, brass spur grommet, minicell foam disk. Available with Mesh side or Solid side. Jump to... #485 - Flip Line - 7" x 4.5" Bag with 10' of 7/16 Poly Rope#1150 - Rescue Holster & Bag, 11" Tall, 3.5" Dia.#1152 - Rescue Holster & Bag w/ 55' of 1/4" Spectra Rope#1120 - Basic Kayak Bag / BAG ONLY#1121 - Basic Kayak Bag w/50' of 5/16" Poly#1122 - Basic Kayak Bag w/50' of 1/4" Spectra#1125 - Outfitter Kayak Bag / BAG ONLY#1126 - Outfitter Kayak Bag with 50' of 5/16 Poly#1127 - Outfitter Kayak Bag with 50' of 1/4 Spectra#1125T - Outfitter Kayak Bag Tall /10" Tall x 4" Dia.#1126T - Outfitter Kayak Bag Tall w/ 70ft of 5/16" Poly Rope#1127T - Outfitter Kayak Bag Tall w/ 70ft of 1/4" Spectra Rope#1135 - Outfitter Medium Bag / BAG ONLY#1136 - Outfitter Medium Bag with 50' of 7/16" Poly#1137 - Outfitter Medium Bag with 50' of 3/8 Spectra#1145 - Outfitter Large Bag / BAG ONLY#1146 - Outfitter Large Bag with 75' - 7/16" Poly#1147 - Outfitter Large Bag with 75' - 3/8 Spectra #1155 - Reverse Taper Medium Bag/ BAG ONLY#1156 - Reverse Taper Rescue Bag w/ 50' of 7/16" poly rope#1157 - Reverse Taper Medium Rescue Bag w/ 50' of 3/8" Spectra rope #1166 - Reverse Taper Large Rescue Bag w/75' of 7/16" poly rope #1167 - Reverse Taper Large Rescue Bag w/75' of 3/8" Spectra rope#1001 - Small Bow Line Bag 10"tall x 5" diameter#1100 - Medium Bow Line Bag / 11" tall x 7" dia.#1110 - Large Rope Bag / 17" tall x 11" dia.